When the Upper Kirby standard, Weslayan Cafe, closed its doors two years ago, Tony Bagatelas and his restaurant-veteran father James Bagatelas jumped at the chance to open their new cafe. 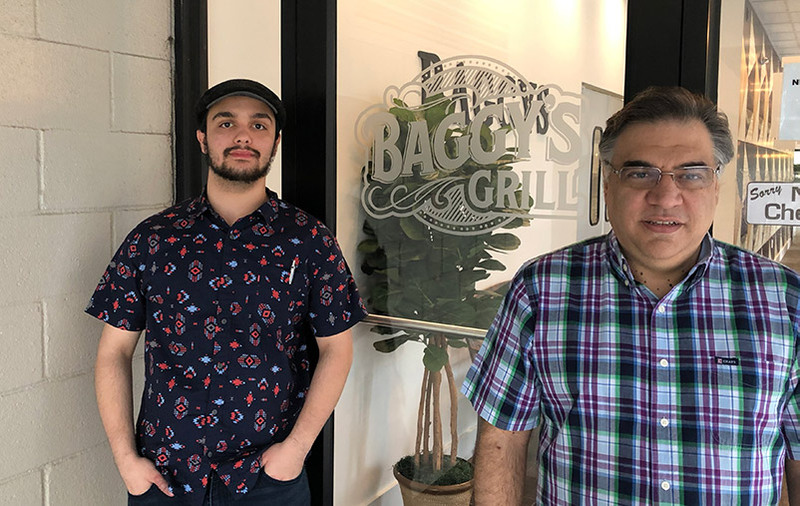 Baggy's Grill opened this month at the well-known ground floor location of the Chase Bank building parking garage at 2900 Weslayan, just down the block from Central Market. Saturday morning this past weekend, the GiH Team felt like some pancakes (Baggy's neighbors claim that the whole block smells like pancakes every morning) and so we made our way to the easy-to-find, bright and inviting cafe. The first thing we noticed was that parking should never be an issue. With plenty of parking up front, Baggy’s patrons also have access to the Chase Bank parking garage for free. We were warmly greeted at the door by Owner Tony Bagatelas with a huge smile and a handshake. Manager, Andrew Mays handed us menus and took our order: “Here for breakfast?” Mr. Mays asked. We replied affirmatively. “Well it’s all good, and there are a lot of options!” he continued. He wasn’t kidding; Baggy’s menu is HUGE. With over forty items and breakfast taking up most of it, it’s no wonder you can smell pancakes down the street. 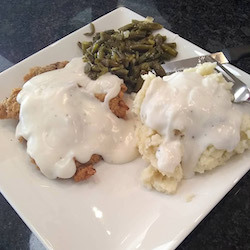 Baggy’s Grill's menu features American (traditional) style breakfast and lunch, as well as some wonderful Greek dishes! We had the eggs and pancakes breakfast, along with A LOT of coffee. The eggs were fluffy, sausage patties were tasty, and the large pancakes were delicious. Lastly the super-hot coffee kept coming, so we were happy. The food was great, but the fun conversations we had with the gracious and kind owners made our morning. James Bagatelas immigrated to Houston from Greece in the 1950s. After working his way up at the Hilton Hotel, he opened his own restaurant. Over the years, he partnered with close friends and opened more businesses, making many Houstonians happy with his infectious smile and warm laugh – not to mention terrific food! In more recent years, Mr. Bagatelas ran the Avenue Grill at 1017 Houston Ave, near downtown Houston. After closing the famous Grill, James’s son Tony took over the business and began searching for the family’s new adventure. With Tony in the driver’s seat now, and after a retail real-estate agent friend of Tony’s heard about the property’s availability, the deal closed quickly, and the Baggy’s Team moved in. There’s more family at Baggy’s Grill: Tony’s nephews, Andrew and James Mays are also part of the Baggy’s Team, and we sat down at the “Family Table” when we visited. You know the table; it’s the loudest one at the front of the restaurant where the Matriarch or Patriarch of the family sits, surrounded by bills, coffee cups and grandchildren. Baggy's Grill is one of Houston's brightest new Breakfast and Lunch spots to visit. You'll love the food and the family! They are located at 2900 Weslayan St Suite A, Houston, TX 77027. Visit them on the web at: www.baggysgrill.com. Get your fix Monday-Friday 7AM-6PM and Saturday 8AM-2PM.